Recycled materials are a hot commodity for designers as many of them try their hand at creating environmentally-friendly designs. Whether they are saving objects from the landfill or simply finding a new way to use items that we see every day, the creators of these novel lamp designs all incorporate recycled materials and the result is some truly impressive illumination. When a particular type of technology falls out of favor and it is no longer used by anyone, it usually results in a big load of trash – or a box of unused items in the storage closet (we’re looking at you, VHS tapes). Instead of pitching these relics of the past, some inventive folks are turning them into lighting fixtures worthy of an archaic technology museum. Photographic slides, old traffic lights and floppy disks all make for some wildly interesting lamps and lights. 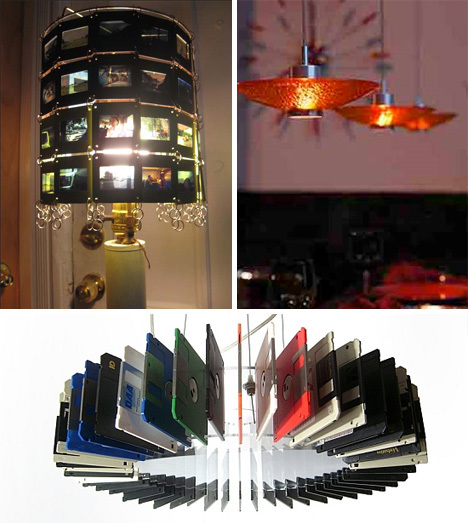 Old cassette tapes and a classic iMac G4 are transformed into some truly unique lamps that would brighten any home or workplace. It takes a creative mind to look at something that most people would consider trash and see only possibilities. 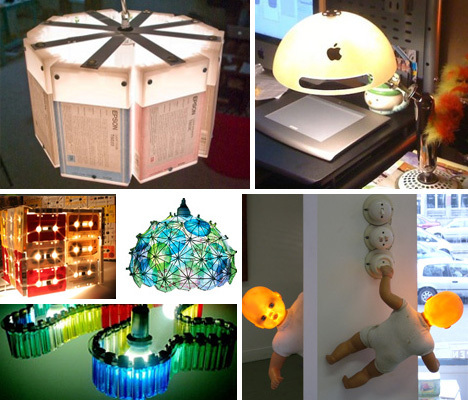 Among the most fascinating recycled lamps are those made from actual trash – either pulled from the bin or saved especially for a particular project. Diverse items like empty spray paint cans (top left), empty glass bottles (top right), used-up disposable lighters (middle left), cardboard banana boxes (middle right) and spent printer toner cartridges (bottom) have been transformed into surprisingly stylish lighting. Some of the most memorable designs are born more out of necessity than creativity. Working with the materials at hand rather than going out in search of something new can produce spectacularly creative results. 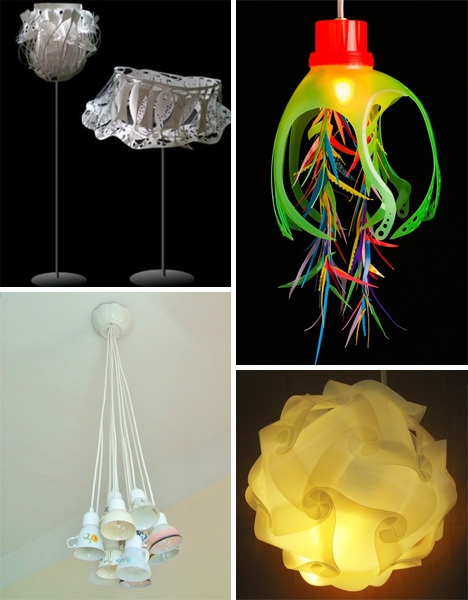 Here, everything from plastic cups to newspapers to drinking glasses are repurposed – even old light bulbs are used in a delightfully playful fixture that allows them to continue providing light long after their filaments have burned out. 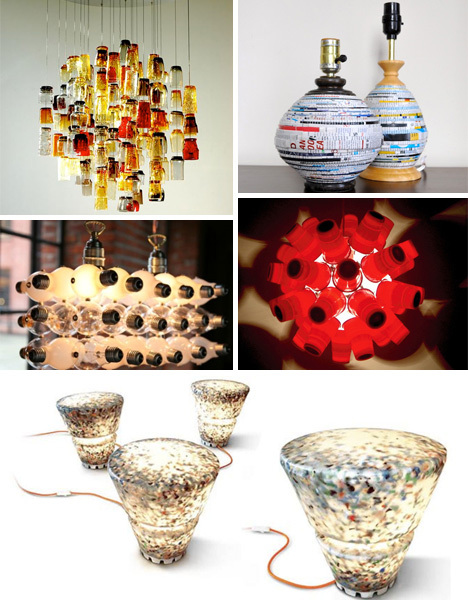 At bottom is a project from Rodrigo Alonso that uses crushed electronic waste, waste plastic and smelted aluminum cans to create beautiful new lamps from mostly recycled materials. At times, the recycled materials and the finished product have equal importance, such as in the cases of these recycled lamps. 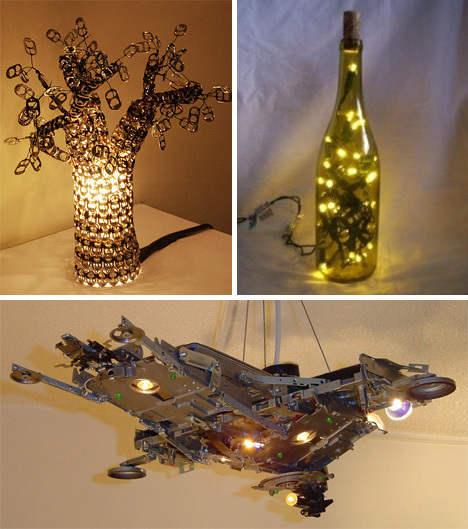 Soda tabs, an old wine bottle and discarded computer parts contribute to lamps that are not only beneficial to the environment, but are conversation starters as well. In the hands of creative individuals, just about anything can become a stunning light. Used plasticware, old plastic drinks bottles, and even an old martini shaker are turned into entirely new products that just happen to be made from “old” components. The availability of lamp kits and free online lamp-making instructions have made the pursuit of recycled lamp making accessible to just about everyone. For those who don’t feel creative enough to invent a whole lamp out of recycled items, this product requires nothing more than a few minutes and nine empty plastic bottles. You just insert the bottles and plug in the cord, and you have an instant recycled lamp that you can proudly proclaim you made yourself. Some designers create their recycled lamps with such bizarre materials that it is hard to imagine where their inspiration may have come from. 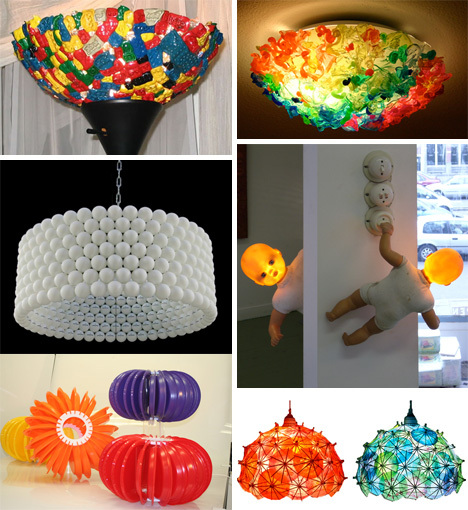 From top left: melted Lego blocks, plastic ice cream spoons, ping-pong balls, baby dolls, plastic plates and paper cocktail umbrellas all serve as foundations for some of the weirdest recycled lamps to ever grace a living room. 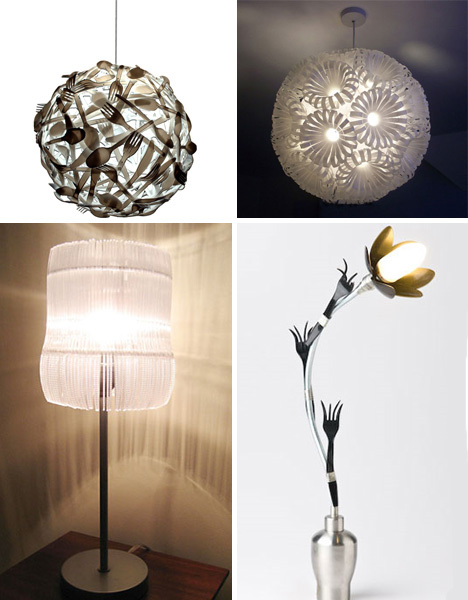 Even items which would seem to be miles away from items that most people would use to create lamps are fair game. Disposable pens, plastic coffee stirrers, ceramic bowls and even real chicken eggs are the materials that just happened to arouse some designers’ creativity. These unusual lamps manage to look sophisticated even though they are, logically speaking, made from trash. How many of these designs would you bring into your own home? Many of them give few hints as to their previous lives and simply look like expensive designer home accessories. 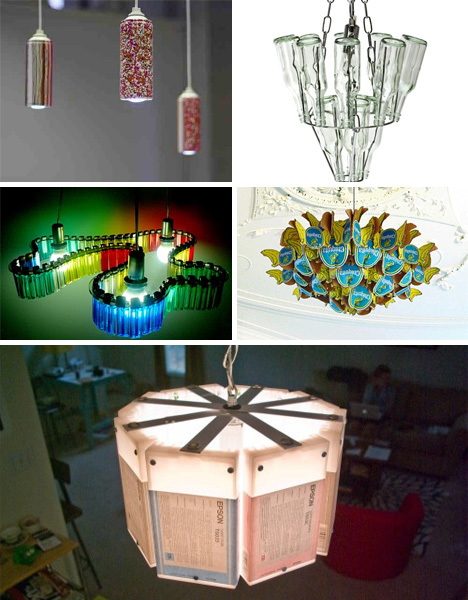 Here, cut paper, old detergent bottles, teacups and used milk jugs are transformed into truly stunning lighting fixtures unlike any others. 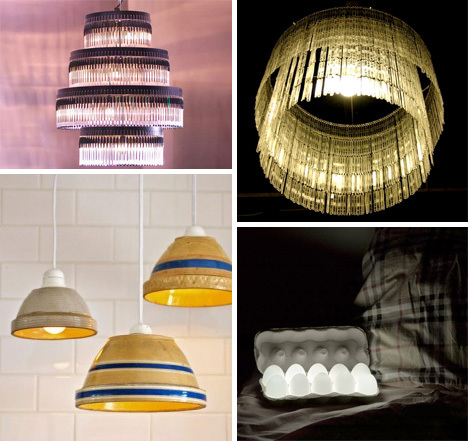 It seems that there is literally no end to the creative ideas behind recycled lamps and lights. 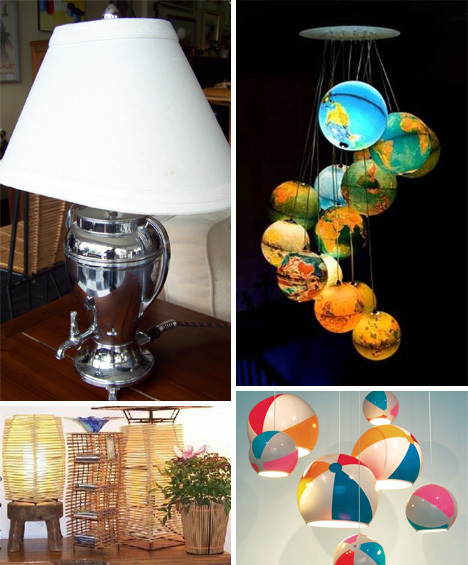 Pictured: a coffee urn, old globes, used (and cleaned) chopsticks, and real beach balls are all highly unconventional materials to make lamps from, but somehow they work – and the finished products are unquestionably stylish.